This holiday season, Tiffany & Co. introduces the latest chapter of its “Believe in Dreams” campaign, which takes viewers behind the scenes of a Tiffany workshop where surprising and surreal moments unfold, featuring a star-studded cast of characters. The campaign film opens at Tiffany & Co.’s iconic Fifth Avenue flagship store, where actress, musician and style icon Zoë Kravitz stars as a Tiffany sales professional working late into the evening. 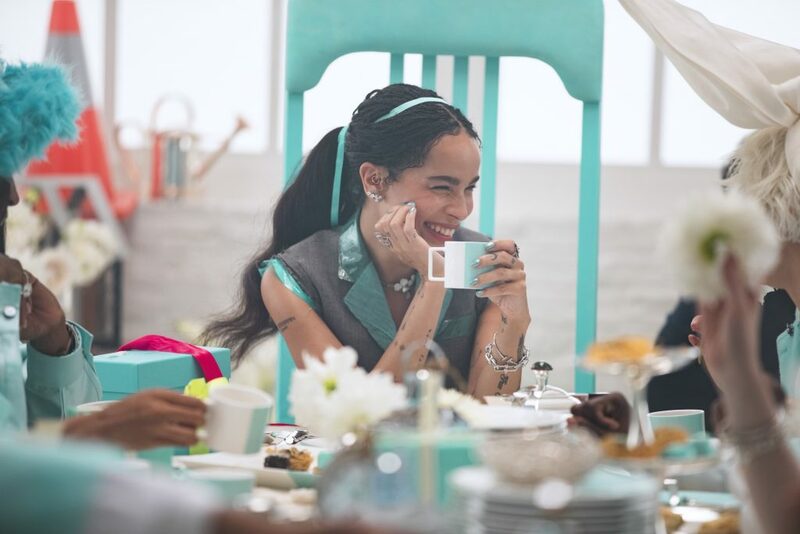 Kravitz is drawn from reality into a Tiffany Blue® dreamscape infused with pops of neon. At the heart of this whimsical wonderland is an underground holiday workshop with craftspeople, and at the helm is a quirky manager played by model Xiao Wen Ju. The exquisite workmanship and masterful artistry of Tiffany & Co. are brought to life in a series of witty vignettes with cameos from models Karen Elson and Maye Musk, among others. The journey culminates in a “madcap tea party” hosted by Naomi Campbell, complete with a delectable selection of pastries from The Blue Box Cafe™ and housewares and table settings from the Home & Accessories collection. By the end of the story, Kravitz discovers that the magic of Tiffany & Co. is where creativity and craftsmanship come together. The “Believe in Dreams” holiday campaign showcases both Tiffany & Co.’s iconic and new collections, including Tiffany Paper Flowers™, Tiffany HardWear, Tiffany T, Return to Tiffany® and Tiffany Keys. The fantastical film set draws inspiration from the accessories and home collections, with life-sized designs adding another layer of surrealism. The film was directed by Mark Romanek, most recently known for creating Beyoncé’s “Lemonade” and features Aerosmith’s 1973 hit “Dream On,” sung by superstar vocalist Steven Tyler. The campaign film launches globally on November 16. To coincide with the craftsmanship theme for holiday, the Tiffany New York flagship store will feature an actual workshop that will house jewelers, stonesetters and engravers. The Tiffany workshop will be on display, from November 16, 2018 to January 1, 2019. In 1837, Charles Lewis Tiffany founded his company in New York City where his store was soon acclaimed as the palace of jewels for its exceptional gemstones. Since then, TIFFANY & CO. has become synonymous with elegance, innovative design, fine craftsmanship and creative excellence. During the 20th century its fame thrived worldwide with store network expansion and continuous cultural relevance, as exemplified by Truman Capote’s Breakfast at Tiffany’s and the film starring Audrey Hepburn. Today, with more than 13,000 employees, TIFFANY & CO. and its subsidiaries design, manufacture and market jewelry, watches and luxury accessories – including more than 5,000 skilled artisans who cut diamonds and craft jewelry in the Company’s workshops, realizing its commitment to superlative quality. The Company operates more than 300 TIFFANY & CO. retail stores worldwide as part of its omni-channel approach. To learn more about TIFFANY & CO. as well as its commitment to sustainability, please visit tiffany.com.